Images of Olivetti (formerly Pepsi Cola) Building, New York City, by Skidmore, Owings and Merrill, 1960. Digital Imaging Project: Art historical images of European and North American architecture and sculpture from classical Greek to Post-modern. Scanned from slides taken on site by Mary Ann Sullivan, Bluffton College. 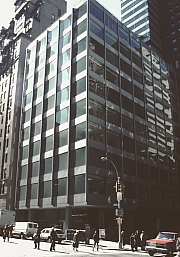 Paul Goldberger, who is generally critical of the repetitive International Style architecture built in the 1950's and 60's says this building is "a jewel of metal and glass that plays off well against the older masonry buildings that surround it" (The Skyscraper [NYC: Knopf, 1981]). Other buildings on this site by SOM include: Alcoa Building, Beinecke Rare Book Library, Yale, Columbus City Hall, Crown Zellerbach Building, Richard Daley Center, Davies Symphony Hall, Fort Wayne Museum of Art, Galvin Library, Illinois Institute of Technology, Hastings College of Hall, John Hancock Building, Hirshhorn Museum, Lever House, The Republic (Newspaper) Building, and the Sears Tower.